Did you hear the news? Parsippany was recently named one of the Best Places to Live by Money Magazine! Maybe we’re biased, but we have to agree. Rauchberg Dental Group is proud to be our city’s dentist offering all the treatments you expect, like general checkups, cleanings, and routine fillings, as well as specialized services like Invisalign in Parsippany. It’s a clear braces system for adults and older teens that moves the teeth into the proper position using a series of clear plastic aligners. Keep reading to learn more about subtle orthodontics with Invisalign! More adults are choosing to undergo orthodontic treatment than ever before. Maybe they know that the benefits of straighter teeth go beyond the cosmetic. Teeth that line up the way they should are easier to brush and floss, for better tooth and gum health. And when the bite fits together properly, your TMJ (temporomandibular joint) is relieved of undue stress and pressure. People dealing with dental misalignments often experience jaw pain, but braces can correct the issue. With Invisalign, teeth are repositioned without metal brackets and wires. The FDA-approved system uses a series of clear, plastic aligners that place pressure on different teeth throughout the treatment. Wear each tray for two weeks before advancing to the next in the series. In one year, on average, the treatment is complete — and you’re smiling more confidently than ever before. Invisalign trays are removable, while metal braces are permanently affixed to the surface of the teeth. Remove the Invisalign trays before meals and snacks and continue to eat what you like throughout treatment. Traditional braces create difficult barriers to brushing and flossing, but dental hygiene is as easy as before with removable Invisalign trays. Feel confident during important meetings or introductions by removing your Invisalign trays completely. As long as you are wearing the aligners for 20 to 22 hours each day, you can feel free to take them out when life calls for it. Smooth plastic is more comfortable than metal brackets and braces, which tend to rub blisters in the cheeks, tongue, or lips. Fewer visits to the dentist are required throughout the Invisalign treatment. And because there’s no worry of a popped off bracket or loose wire with Invisalign trays, emergency visits for repair are rarely necessary. Most people who wish to benefit from clear braces with Invisalign are good candidates for the treatment. You will need to schedule a checkup and cleaning before beginning with Invisalign. Cases of gum disease and/or tooth decay should be treated before or alongside your orthodontic treatment. 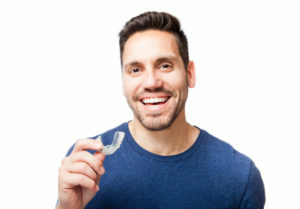 Invisalign improves the alignment of crowded teeth, gapped teeth, and overbite, underbite, or crossbite. Over 3 million patients worldwide have chosen the treatment — will you be next? Contact Rauchberg Dental Group to schedule an appointment and discuss Invisalign with your dentist in Parsippany NJ today!